I designed, illustrated and wrote the text for this 2 x 3 foot sign. But, my interpretive projects are illustrative. It helps people realize that even if they don’t see animals in every nook and cranny of a habitat, those little places are all important in some way, at some time, to some creatures. In a healthy habitat, nature tends to fill in the gaps with life. Often, what wildlife needs more than anything is time and space in quiet, undisturbed places where they can hunt, rest, feed…whatever. You can learn from them—wildlife watching takes time and patience. You have to stay still and quiet. If you wait long enough, something will show up. And when it does, back off a little. Give it some space. Mallards seem to be found anywhere there’s water. They feed by dabbling, or tipping upside down and nibbling plant material growing on the bottom of the pond. There are actually domestic mallards and wild mallards, which interbreed and produce semi-domestic hybrids. At some point, wild mallards will probably be bred out of existence. It’s fun to watch great blue herons hunting. They stand perfectly still, poised with their necks stretched forward, then, strike! 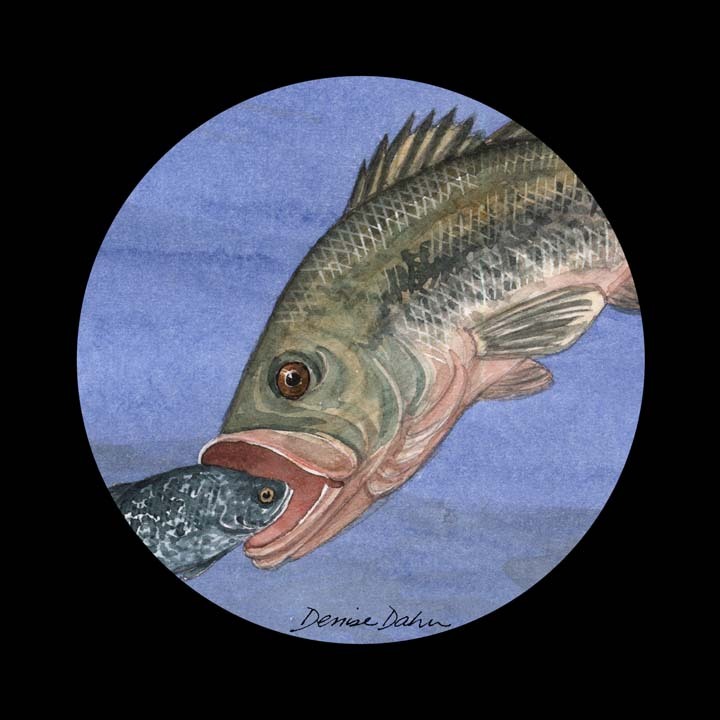 Fish, frog, or snake get stabbed with the bill and gobbled down as quickly as possible. They manipulate the prey to get it to go down headfirst. I guess it’s easier to get a squirming critter down your gullet head first. 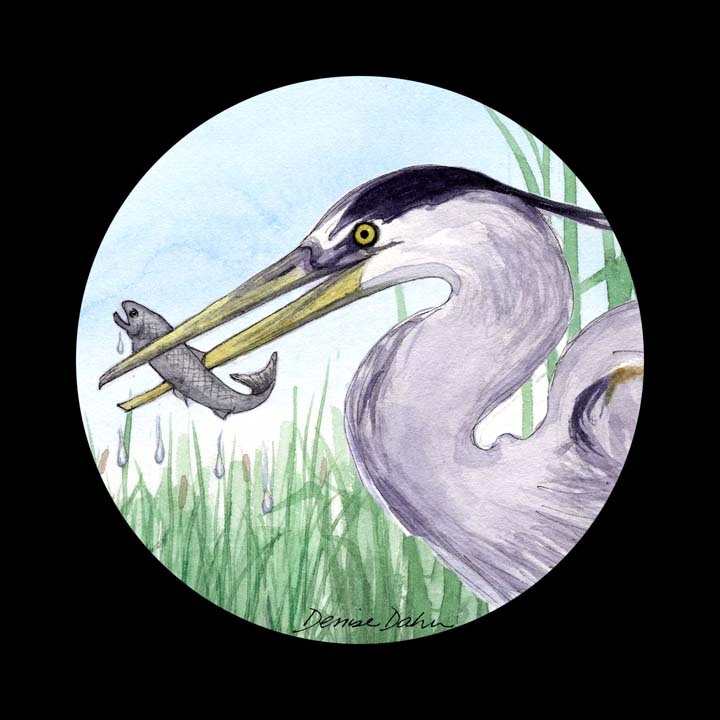 This entry was posted in Recent Posts, The Natural World and tagged bass, biodiversity, Dahn Design, Dankworth Ponds, great blue heron, interpretive sign, mallards, watchable wildlife by dahndesign. Bookmark the permalink. Hi Denise, LOVE how your signage (and site: ) appeal to all ages… You are SO right about how important it is for people to see the whole picture -understanding the possible REaction to their action. Thanks, Deb! I love the term puddle duck, too. 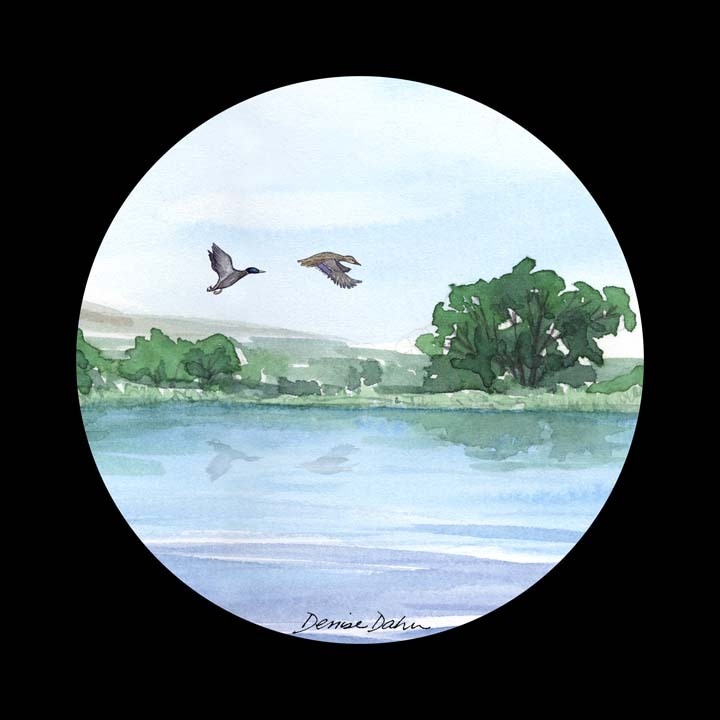 It brings to mind childhood and the wonderful watercolors of Beatrix Potter! How many of the places you make signs for are you able to visit? (Oh my, there must be a clearer way of asking that, but at this time of night my brain cells are not getting much traction.) You know what I mean…. Such a beautiful sign… And we can only hope that this wonderful biodiversity, full of such magnificent creatures, is maintained. Not destroyed at our clumsy human hands! Thanks, Christina…I guess one way to help maintain biodiversity is to encourage people to notice the life around them…(what we’re both trying to do with our blogs, right?) Note to readers: check out Christina’s blog, Serenity Spell. Her wildlife photos and musings are truly magnificent! 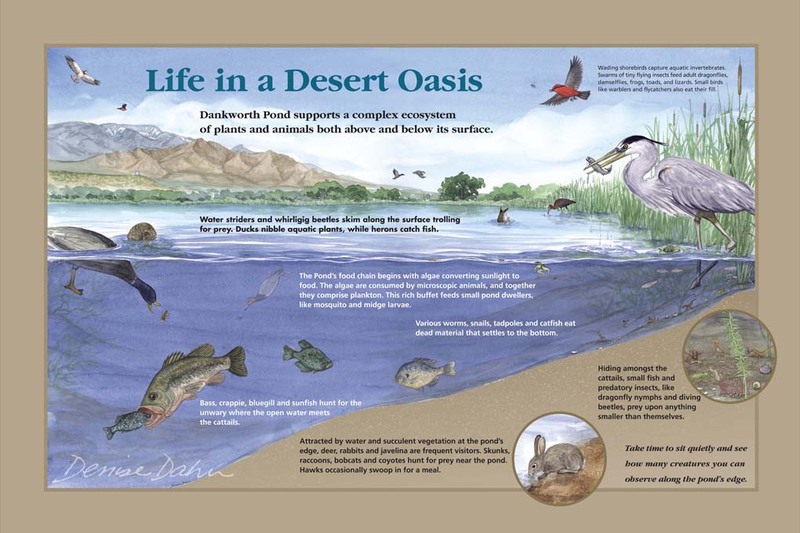 The interpretive signs you do are a wonderful primer for those visiting new and unfamiliar areas. At a glance a person can see what critters inhabit the land, are unseen under water, and populate the air around them. Then the person can choose to wait and watch and/or do further reading. But I suppose your geologic interpretive signs would take much more patience on the part of the observer to actually see the landscape change. Carol and I have been living in Garden Valley, Idaho, for the the last 6 months. We have the ability to watch critters from the comfort of the cabin or on walks around this former ranch. It is amazing to see herds of Elk numbering a 100 or more in the fields around here. More amazing still, to see animals that large 15 feet away grazing in the front yard. Deer, coyotes, turkeys, fox, quail by the dozen,owls, and the hawks that come in for the quail and other birds – all right outside our windows. It is interesting to watch these animals and their habits as the seasons change. The locals say the wolves come in when the elk start their birthing. (I remain skeptical until I see the wolves although a wildlife ranger was quoted in the local newspaper saying that there is not a square mile in Boise County without wolves, mountain lions, and bears – none of which we’ve seen). Say ‘hi’ to Ralph for us. Thanks, Jo Ann. And, just imagine nature in Aristotle’s time! I wish I had a time machine.